Clyde V. Cessna, originally a motor mechanic, built his first aircraft at Enid, Oklahoma, in the spring of 1911. Built and flew several more before moving to Wichita, Kansas, in 1917. Founded Travel Air Manufacturing Company with Walter Beech and Lloyd Stearman on February 5,1925. The Travel Air Manufacturing Company was in es-sence Waiter Beech, Lloyd Stearman and Clyde Cessna, all backed by Walter P. Innes. In 1926, Stearman quit to go it alone. Cessna followed a year later. Cessna's bone of contention was that he thought the monoplane was the way to go, while Walter Beech felt there was life left yet in the biplane. Clyde Cessna started the Cessna Aircraft Company on 22 December 1927 in Wichita, Kansas, delivering his self-financed first aircraft on 28 February 1928 to a Pittsburgh customer for $6500. The aircraft was a Series monoplane, which developed into Airmaster and Model 195 series of four-seat cantilever high-wing cabin monoplanes. Clyde V. Cessna and Victor H. Roos formed a partnership leading to the formation of the Cessna-Roos Aircraft Company on September 8,1927. Roos backed out, on December 22 the secretary of state approved a name change to Cessna Aircraft Company, and on December 31 the Cessna company was incorporated. Production of "A" series (again with cantilever wings) began 1928, as did BW three-seater. Built DC-6 prototype 1929, followed by four-seat DC-6A and 6B. Cessna tried to keep factory functioning during the Depression, producing 300 CG-2 primary gliders, but finally had to close in 1931. Company continued to exist and build several highly successful custom-built racers. 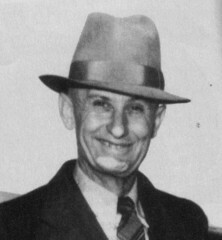 After being forced out of the company in 1931, Clyde is re-instated as president January 17, 1934 thanks to the hard work of nephews Dwane and Dwight Wallace. They teamed to contact every Cessna shareholder to help Clyde regain control of the company. Factory reopened 1934, but Clyde sold his interests and company continued to be run by his son, a nephew, and T. Salter. Went on to develop highly successful Airmaster series and in 1939 the first Cessna twin, the T-50 five-seat cabin monoplane. Latter built in large numbers including nearly 1,200 Crane trainer versions for the RCAF. Adopted also by USAAF, U.S. Army and Navy, and over 5,000 produced during Second World War, serving in all theaters. After the war Cessna began building light aircraft for private and business use. The most successful early models were Models 140 and 170, plus later Models 172, 305,180, and others which became world renowned. Model 305 used widely for liaison duties during Korean War and later as L-19/OE-1 Bird Dog (over 3,500 built). In 1952 Cessna acquired the Seibel Helicopter Company and the CH-1 four-seat helicopter was developed and built in small numbers. 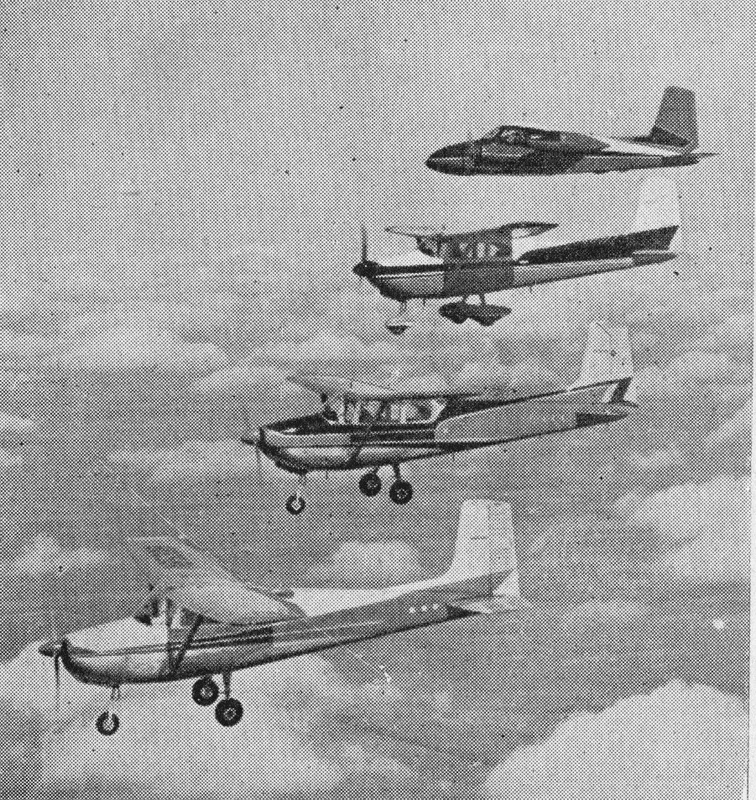 1958 Cessna production included (from top to bottom) Model 310B, Skylane, Model 182, and Model 172. In 1960 Cessna affiliates itself with Reims Aviation, S.A., Reims, France, and acquires McCauley, a manufacturer of propellers and other aircraft components. In 1972 Cessna became the world's first company to have produced 100,000 aircraft. Production has included nearly 2,000 twin-engined jet trainers and A-37 strike aircraft for the U.S.A.F. and U.S. Military Assistance Program. Company's Pawnee and Wallace divisions taken into Aircraft division in 1984, but company sold to General Dynamics in 1985 and then to Textron Inc in 1992. In July 1996 Cessna Single Engine Piston Facility opened in Independence, Kansas, to reintroduce production of single-engined light aircraft to Cessna range. Available Cessna aircraft were Cessna 172R and 172SP Skyhawk four-seat lightplanes as much refined versions of previous Skyhawk, four-seat 182S Skylane as refinement of previous Skylane versions, six-seat 206H Stationair and T206H Turbo Stationair as refinements of previous versions, 208 Caravan (first flown 1982) as single-turboprop commuter, business and cargo aircraft (among other uses) offered in four civil versions plus as U-27A for U.S. foreign military sales, and a range of business jets as six/seven-seat Model 525 CitationJet (first flown April 1991), nine/12-seat Model 550 Citation Bravo (first flown April 1995), nine/ten-seat Model 560 Citation Ultra and latest Ultra Encore (latter first flown July 1998), eight/ten-seat Model 560-XL Citation Excel (first flown February 1996), 15-seat Model 650 Citation VII (first flown February 1991), ten-seat Model 680 Citation Sovereign (for certification in year 2002), 11/14-seat Model 750 Citation X (first flown December 1993), CJ1 (for delivery from year 2000 as successor to CitationJet), and eight-seat CJ2 (to fly 1999).